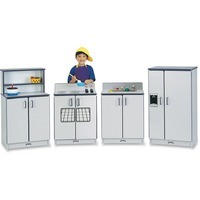 Rainbow Accents Play Kitchen Set JNT2030JCWW112 $1223.46 Inspire budding chefs to prepare gourmet meals with this four piece, play kitchen set. Laminate is durable and features an easy to clean surface. KYDZSafe rounded edges allow children to play safely without getting hurt by sharp edges or corners. Kickplate prevents children from losing their favorite toys underneath. Full length piano hinges prevent small fingers from being pinched when the door is opened or closed. Dowel pin construction prevents weakening at the joints. Standard Write n Wipe recessed backs can be easily wiped clean. TRUEdge is permanently thermo fused to the edges to prevent chipping.